← Food Revolution Day: Be Progressive! Sometimes making lots of different recipes all the time has its drawbacks. For one thing, when my kids were super-little (not that 3 and 5 are ripe old ages, but you get my meaning), my mother remarked once or twice that they might tend to forget in between servings that they actually liked a certain food — that what was “old” would always seem “new” simply because I let recipes languish so long unrepeated. For another, I forget sometimes about recipes we have really enjoyed. Frankly, J. and I, and even the boys to a certain extent, are supremely unfussy eaters. We tend to like almost everything, and the kids will at least EAT most of what is served to them with very little trouble right now. (THANK. GOD.) So for me, if there’s kale in the house, I’m making it every which way; if it’s chicken, it won’t show up the same way twice in 30 or 60 or even 90 days; and even the good old standbys like spaghetti get tweaked and twisted a bit from time to time. I’m not much good with cooking consistently. So when I have the opportunity to recall something brilliant and delicious that we’ve ignored for a while, it’s like rediscovering an old friend. Take, for example, the other evening, when I had made gluten-free chicken nuggets from scratch to appease the kids, and I was sort of rattling around the kitchen not really feeling inspired by the vegetable options. 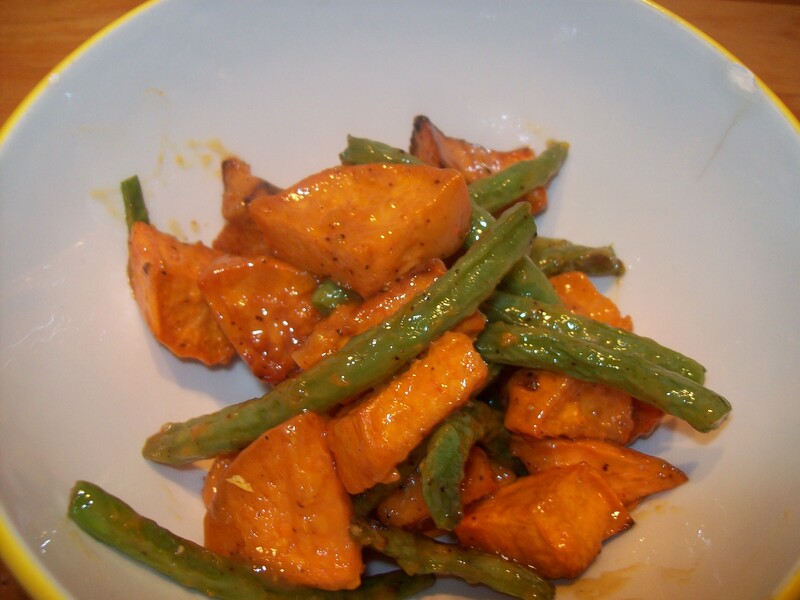 It wasn’t until I came across a random rogue sweet potato — also, itself, forgotten — that it occurred to me to revisit a certain sweet potato and green bean dish we had LOVED when I first concocted it. I’ve also been nudged now…oh, probably a dozen or more times…by blog readers to post a recipe for a certain slow-cooker chicken dish. At first I didn’t want to post it because I didn’t like all the ingredients (it’s based on one of those heavily processed slow cooker recipes that are all over the place) and I was still tweaking it. Then I simply forgot. And then, as sometimes happens, the recipe fell out of favor with the kids, and I got bored with it, and it wasn’t until today that yet ANOTHER reminder from somebody over on the RRG Facebook page jostled me enough to decide that I ought to drag that one, dusty and groaning, from the recipe file. Just because my kids aren’t fond of it (anymore) doesn’t mean someone else’s might not be; and who among us can’t use another good slow cooker recipe, anyway? Finally, in a conversation somewhere else in the world, I overheard a request for a recipe for homemade fruit dip. I didn’t have one, so I didn’t offer anything. But it nagged at me for a day or two, until at last I realized that I DO have a recipe that would make an excellent fruit dip, I think. It wasn’t conceived of for that purpose, but in fact, that might be exactly the right use for it. I’ll likely give it a shot with P. sometime soon, since he’s a fruit kid, a dipping kind of kid, AND the kid who gave me the original thumbs-up on the recipe when I made it for him as a topping for a cinnamon English muffin. He asked for more on the side, as I recall…and then drank it. Which means it’s probably worth sharing. So here, friends, is something that’s been a bit scarce around here lately: A recipe bonanza! Three recipes, all forgotten and rediscovered in some fashion, and all deserving of a place on Red, Round, or Green. This one is a remake of a slow cooker recipe originally published by Sandra Lee from the Food Network. Years ago, I picked up one of her slow-cooker cookbooks on clearance just to see if the recipes would inspire me to create some less processed versions for our family. Her West Indies Chicken was easily the only one we really ended up caring for in any fashion, but it still took me quite a while to reinvent it in a way that pleased us. Combine all the ingredients in your slow cooker, stirring well to combine. Cook on LOW for 8 hours. Serve over brown rice, cous cous, or quinoa. This entry was posted in Cooking, Feeding kids, Meal planning, Parenting, Slow cooker and tagged cooking, family, feeding kids, food, Household organization, kids' health, meal planning, parenting, recipes, Trader Joe's, veggies. Bookmark the permalink. 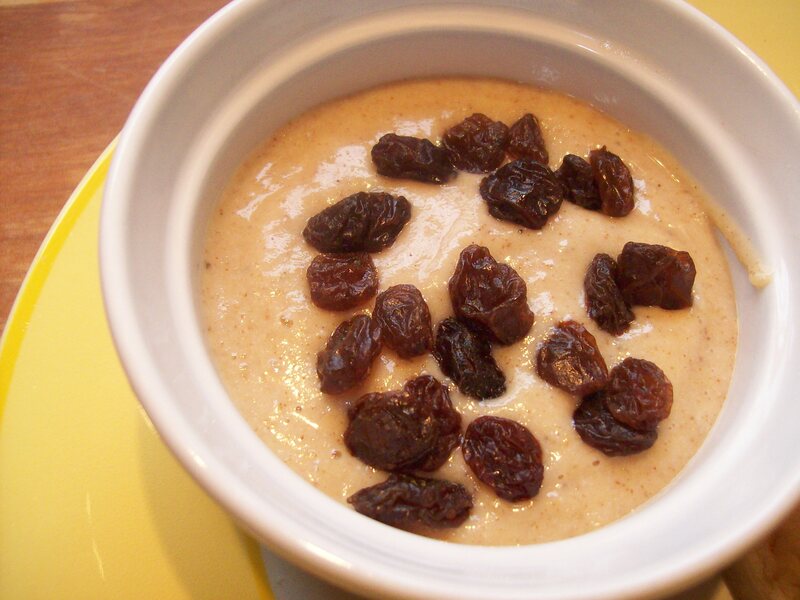 I actually have a fruit dip recipe to share, though I’ll admit it’s of the processed food type. I’ll bet with some ingenuity and a little more kitchen work, it could be converted to “real food”. The recipe was provided by Weight Watcher’s many many years ago (like before their points system) and somehow, I got my hands on it. Mix the two together thoroughly until all the powder disappears. That’s it. Oh my gosh, you are too funny! I didn’t know you didn’t want to post it – LOL! I wouldn’t have bugged you for it 😉 Thanks for posting though, I am going to try it for sure! It’s totally cool! 🙂 I did get it to the point where I was happier with it, but then completely forgot. Try it and see what you think!